Who needs the Super Bowl when you have World Nutella Day? One time my Spanish roommates tried to tell me that peanut butter was too rich and fattening. I eat the all-natural, unsweetened kind, and I feel like there is NO WAY that’s more fattening than Nutella! Anyways, my favorite way to eat Nutella: toasted brown bread (something dark, like a good rye), topped with nutella and fresh berries. Great Blog! Interesting facts about Nutella I didn’t know. Nutella was THE spread when I grew up. The other day I came across a documentation by Miki Mistrati who identified Ferrero as one of the major chocolate producers that uses cocoa harvested by child slaves. Same goes for the hazelnuts they use for Nutella. I absolutely HATE that they do this. From now on for me FAIR TRADE is the only way to go. If you want to find out more about this look for “Slavery in the chocolate industry” on youtube. A staple in our house for many years. Does anyone remember when LA Laker Kobe Bryant used to endorse it? One of my favorite snacks!!! Mmmm. I just had nutella on focaccia at a cafe in Lucca, Italy yesterday. They put it in a wood-fired pizza oven so it was warm and melty and soft. So delicious! Um, I have not tried this yet. They are advertising Nutella more and more on the tube. I have always enjoyed hazelnuts and then there’s chocolate. Well who can enjoy life without chocolate? The only drawback i see is the sugar content. Much higher than peanut butter. Funny because the calories are near the same. I’m going to try it. During the Supper Bowl, I don’t know what my friends would say. Likely to just care about the beer. i have seen beer with hazelnuts added. Hazelnut creamer usually goes in my coffee. You’re blog is awesome. I’d love to have it as my 365 day desk calendar OR digitally themed calendar. Hm, they should have that as an add on. RE: nutella – have you had the pleasure of trying: Rawtella? OK John-Bryan let’s not go crazy here. “Who needs the Super Bowl?”, them’s fighten words my dear. Nutella IS fantastic but I would rather watch the Super Bowl or even better have Nutella crepes as a snack as I’m watching the Super Bowl. Super Bowl love to all. I love your blog! Thanks for visiting (and liking) mine! I look forward to reading more! 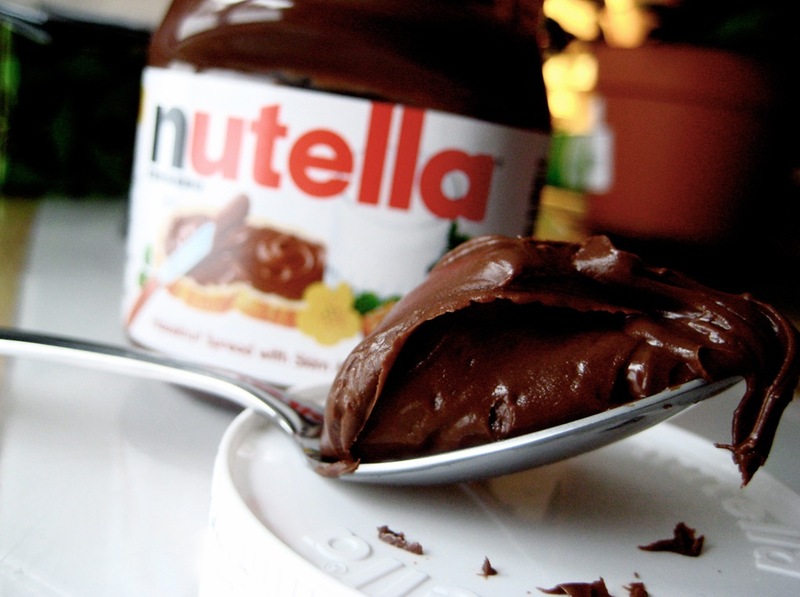 Wait…there’s a World Nutella Day? Well that gives me something to celebrate tomorrow, then. The rest can have the Super Bowl, Da Bears isn’t in it anyways. I’m NUTS over NUTELLA! Yes, I went there…Thx for sharing!!! I don’t know why but when I first saw that pic, I thought it was a prune or a date on the spoon. I love Nutella. It keeps forever (if you can refrain from eating it)! Love Nutella! Had a big WND party last year…no funds this year, but will certainly be enjoying a spoonful at least this year! Had to reblog this…Nutella is my favorite vice! I grew up with it and now I can eat a whole jar if I’m not careful! Now I have to get some and I’ve been so good resisting it. it is my vice…I LOVE the stuff! Nice job sharing your Nutella love! I went to Italy a few yrs ago and every hotel we stayed in had little nutella containers on the breakfast table. So delicious!! I am loving this blog, and wanted to share it with all of you. So many fun food facts! Love Nutella. I think in USA it tastes different too.